– Did I mention fat? GET TO THE GYM, CHUBS! But do you know what comfort actually means? It’s defined as “a state of physical ease and freedom from pain or constraint” or “the easing or alleviation of a person’s feelings of grief or distress.” Huh. That doesn’t sound bad at all. In fact, it sounds like what we all hope for, especially these days. Why, then, are we constantly exhorted to eschew comfort? And shamed if we don’t? My comfort zone is an awesome place. I built it with intention. It took years and years of hard work to figure out what it should look like, how it should feel, who should be allowed in, and what its boundaries were. My comfort zone is where I am most myself. It’s where I go to heal, to rest, to regenerate. You do not need to live in perpetual motion. 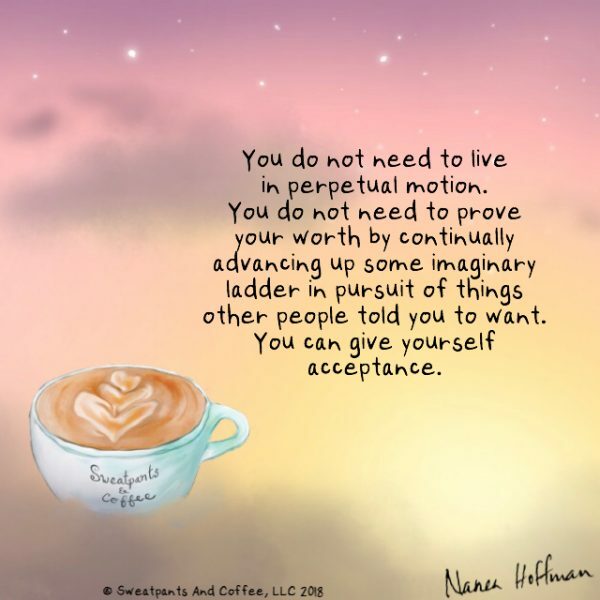 You do not need to prove your worth by continually advancing up some imaginary ladder in pursuit of things other people told you to want. You can give yourself acceptance. You will not stagnate. You can be quiet and still. You can tend to your needs and give yourself nourishment. You can fill up on compassion and empathy. You can be soft. None of that is anything to be ashamed of. When I’m hurt or tired or disconnected from myself, I know that that is when I do the most damage. To me. To those around me. To what I love. But when I’m full? I can be kind and creative and patient. I can be present in my life and the lives of others. GET IN THAT COMFORT ZONE! WHATEVER THAT LOOKS LIKE FOR YOU! STAY THERE FOR AS LONG AS YOU NEED TO! You know what grows there? Me.